Bio Link Shell Aid is a complimentary liquid feed supplement for poultry. It looks after your eggs from the outside in. Suitable for all breeders and layers. Uneven and rough textured shells. 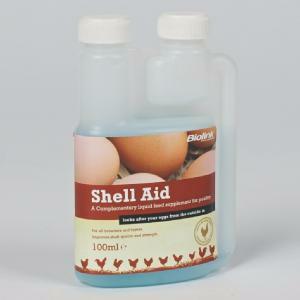 Use 5ml of Shell Aid to every 1 litre of clean drinking water. Treat for 5 days. Do not use undiluted.